Discover the sacred Wandjinas and that it is not good to paint them without permission. They are deeply spiritual to the people of this area, the Mowanjum people, who comprise three language groups, the Worrorra, Ngarinyin and Wunumbal . 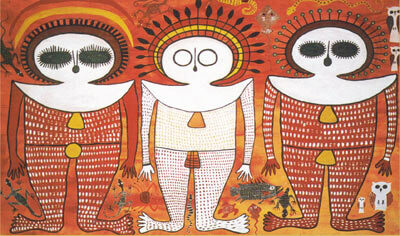 Three Wandjinas painted by a contemporary artist of the Mowanjum Art and Culture Centre. Image used with kind permission. Unique to the Mowanjum people, Wandjinas (sometimes pronounced 'wannias') have large eyes, like the eye of a storm, but no mouth. It is said they have no mouth because that would make them too powerful. They are often depicted with elaborate headdresses, indicating different types of storms. In a lot of Western Australian Aboriginal languages "jina" means "feet", and therefore some see a connection between Wandjinas and the sacred act of walking the land. Following proper cultural protocol, only Aboriginal people who went through the law are allowed to use Wandjinas. "Only a few Aboriginal artists ever win the right to depict Wandjinas, and only then after years of initiations and ceremonies," says Adrian Newstead, owner of Coo-ee Aboriginal Art Gallery in Bondi, NSW . Inappropriate art work in the Blue Mountains, NSW. The artist called this work "Wandjina Watchers in the Whispering Stone", but didn't consult Aboriginal people to find out if it was appropriate to create in the first place. Chris refers to an incident in the Blue Mountains when artist Ben Osvath created a wandjina sculpture for art gallery owner Vesna Tenodi . Tenodi maintains that "in art it's anything goes"—but he was very wrong. "It's presence mocks and denigrates the spiritual beliefs of the Worrorra people," says Worrorra Elder and senior lawman Donny Woolagoodja in his submission to the NSW Land and Environment Court. 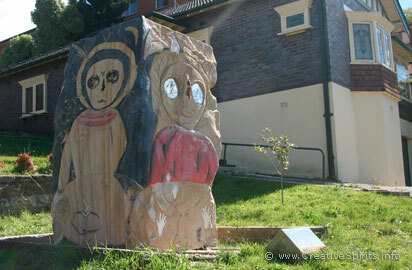 The court upheld in June 2011 a decision by the Blue Mountains City Council to have the offending artwork removed . Similarly, when scores of Wandjina paintings appeared on walls, trees and fences in the greater Perth area Aboriginal people were very angry. But in Perth the creator of the paintings could not be identified. The film Who Paintin' Dis Wandjina? examines the events in Perth. Where can you purchase Wandjina images? Mowanjum people continue to paint the Wandjina image, reinterpreting this astonishing tradition through contemporary practice and mediums. The Mowanjum Art and Culture Centre in Derby is a 100% Aboriginal-owned art centre, managed by a committee of artists. The centre provides significant income to many Aboriginal community members through the sale of works of art and also supports important social and cultural activities, including the transmission of culture. It offers a culturally appropriate way to learn more about Wandjinas.